KOKOMO, Ind. — When one family member is in college, it can feel like the whole family is enrolled. Commencement 2012 View Flickr gallery. 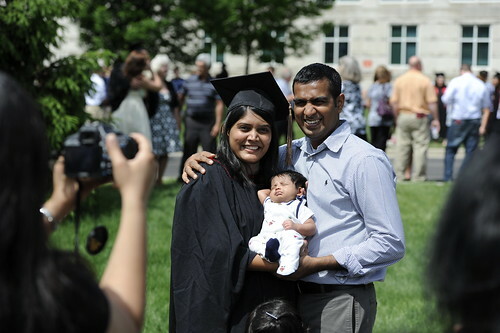 Commencement ceremony on Tuesday (May 8) at Indiana University Kokomo was a family event – with parents, husbands, wives, children, other relatives and friends coming to cheer for and celebrate with their graduates. After the ceremony, family groups clustered on campus, offering flowers to the graduates and posing for pictures in front of IU flags and the newly planted flowerbeds. 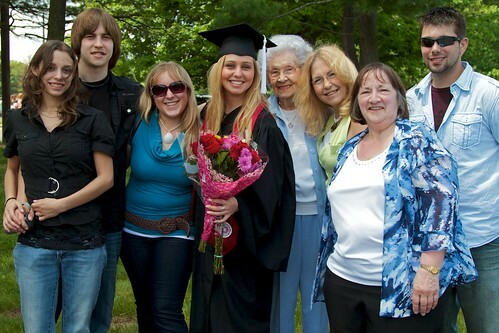 Meghan Webb of Peru continued a family tradition by earning her degree at IU Kokomo, just one year after her mother graduated here. She earned a degree in education, and is now looking for a job teaching secondary social studies. She said the School of Education has more than prepared her for the classroom. “They do a great job getting you ready to be a teacher,” Webb said. Stephen Diamond said he will be back in classes Monday, starting his Master of Business Administration, after receiving his bachelor’s degree in psychology Tuesday. “I’ll just have a little break, and then start again,” he said. Diamond, who lives in Burlington, said he’s built a community during his years at IU Kokomo. Sheri Adams, who earned a bachelor’s degree in general studies, watched as her children, Sophi, 7, and Sam, 5, climbed a rock in one of the flower beds, taking turns wearing her mortarboard. “It’s about time I graduated,” Adams said, adding that she started her degree 15 years ago, long before either child was born. “They’ve never known a time when I wasn’t in school. They’re looking forward to me having some free time this summer,” she said. Adams, from Tipton, added that they should not get used to her not being in school, because she starts classes in the School of Nursing in August. She said the campus has changed dramatically since she started her degree. Thembie Nkomo and Fidelity Akonji posed for family pictures in the shade of the trees outside Hunt Hall. Both earned nursing degrees. Akonji, from Indianapolis, brought a large family group, including her three small children. Her boys wore matching suits, and smiled up proudly at their mother the graduate. She said she’s happy to graduate, but will miss the people she’s met at IU Kokomo. In the Kelley Student Center, Clifton Crider, from Frankfort, walked arm-in-arm with his wife, Kristine, happy to have completed his nursing degree. Kristine Crider says it is her turn to go to IU Kokomo next. She plans to earn a bachelor’s degree in education. “I hope to be here soon,” she said.